kl.-4. 182 Bll. Mit gr. Titelholzschn., 3 (dav. 1 ganzseit.) Holzschn. u. Druckermarke. Ldr. d. Zt. über Holzdeckel. m. 2 intakten Metallschließen. Rollenstempel, floral. Blindpräg. auf beiden Deckeln. Blindgeprägt. Portrait "Salvator Mundi Ihesus Christus" darunter: "Martinus Pietz" am Vorderdeckel. Hs. Rückentit. Bll. B-E8 rubriziert. 4 Bll. (Zv-8 fleckig), sonst in sehr gutem Zustand. ad 1: A-6.B-8.C-4,D-4,E-8,F-4,G-4,H-8,J-4,K-4,L-9,M-4,N-4,O-8,P-4,Q-4,R-8,S-4,T-4,-8,X-4,Y-4,Z-8,a-4,b-4,c-8,d-4,e-4,f-8,g-4,h-4,i-8,k-8 VD 16 J1174 Proctor 9990 - Sehr seltene, wahrscheinlich einzige deutsche Ausgabe von "De disciplina et perfectione conversationis monasticae". Der Verf. (1381-1456) trat 1402 in das Chorherrenstift auf der Insel Alga bei Venedig ein, wurde 1406 Prior und erster General der Kongregation vom Hl. Georg, deren Konstitutionen er verfaßte (vgl. Lex.f.Th.u.K. IV, 510). Die Holzschnitte zeigen die Herabkunft des Heiligen Geistes, Mariae Geburt, Grablegung und Kreuzigung Christi. - Beigebunden: BONAVENTURA. Der Spygel der Tzucht voll treflicher Lere vnnd Spruche des heilgen Bonauenture, der do mit tapffern kurtzen wortten, sagt vn[d] handelt, von eine[n] erlichen Leben. Nicht alleine allen geistlich[e]n den er tzu eine[n] anschaw[e]n yres lebens gemacht not ... Leipzig, Melchior Lotter 1510. 4 Bll., XCV S. Erste Ausgabe. (VD 16 B 6580). A History of Ancient Mathematical Astronomy. In Three Parts. [3 Vols.]. (=Studies in the History of Mathematics and Physical Sciences 1-3). 1456 S., with Ill., 9 plates 25 cm Hardcover Good condition. Thomas von Aquin (Aquinus Tommaso d'Aquino Thomae Aquinatis). Fol. Durchg. mit zahlr. eingemalten roten Initialen. 331 nn. Bll. (Got. Typ., 2 Kol., 50 Zeilen). Gotischer blindgepr. Ldr.-Bd. d. Zt. über Holzdeckeln m. 9 (von 10) Deckelbeschlägen. Sehr frühe und seltene Ausgabe dieses Teils der Summa des Thomas von Aquin aus der Offizin des aus Hanau stammenden Basler Erstdruckers. Berthold Ruppel war einer der ältesten Gesellen Gutenbergs und stand auf der Seite des Erfinders, als es zum großen Streit zwischen ihm und Fust kam (Geldner I, 111). - Einband berieben, bestoßen u. mit Wurmspuren. Rücken alt mit blindgepr. Leder überzogen u. mit altem Nummernschild. Vorderdeckel m. späteren Bibl.-Nummernschildchen. Schließen fehlen. Ein Bl. m. längerem Einriß u. zwei hinterlegten Stellen (ohne Textverlust). Tlw. etw. feuchtigkeitsrandig, gebräunt bzw. fleckig. Wenige Bll. m. kl. Randläsuren, insgesamt jedoch schönes, vollständiges u. breitrandiges Exemplar. - GW M46480 Hain 1456 Kaufmann/Nabholz 134 Pell 1047 BSB-Ink T-289 Proctor 7450 BMC III, 715 Ohly-Sack 2764 ISTC it00214000 Günther 387 IGI 9592 Panzer I, 194, 278 Heckethorn 3, 4 nicht bei Oates u. Polain. [2 von 3] Bl. 496 S., S. 1001 - 1456, [2 von 4] Bl. (fehlen Titlekupfer und 2 Blatt Register, sonst so komplett) 4 Blindgeprägter Schweinslederband der Zeit über Holzdeckeln mit Schliessen. VD17 39:128945P Sabin 54461 Zweite deutsche Ausgabe [EA Leiden 1655] der seltenen Länderbeschreibungen.Enthält überwiegung Schilderungen Europas, ferner Beschreibungen der Länder Asiens mit Ostindien und dem Osmanischen Reiches, Afrikas und Amerikas. Wohlerhaltenes Exemplar in dekorativen zeitgenössischem Einband. Titelkupfer und zwei Blatt Register fehlen, die ersten beiden Blätter mit kleinem Ausriss außerhalb des Textes, Name von alter Hand auf dem Titel. ILLUMINATED MANUSCRIPT ON VELLUM, Northern Italy (Verona? ), dated 1456, 137 x 101 mm. 450 folios, complete (collation, i6 ii-xl10 xli8 xlii-xliii10 xliv12 [-8, following f. 437, cancelled with no loss of text] xlv10 [-10, cancelled, with no loss of text]), horizontal catchwords, ruled in ink (justification, 86-83 x 65-64 mm. ), written in southern gothic bookhands probably by two scribes, guide letters, majuscules touched with pale yellow, red rubrics, one- to two-line alternately red and blue initials, four- to three-line alternately red and blue initials with contrasting pen decoration in purple and red, THREE ILLUMINATED initials, with decorative borders in the outer margins, and TWO HISTORIATED INITIALS WITH FULL BORDERS, depicting bearded saints. BINDING: Bound in Italy in modern polished pink leather, binder's stamp, inside front cover, "R. Gozzi. Modena," front cover, coat of arms in gilt (azure, three bends or, in chief, gules three towers or, with a crown above), elaborate embossed silver clasps, with both clasps, front and back covers, depicting the sacrifice of Isaac (? 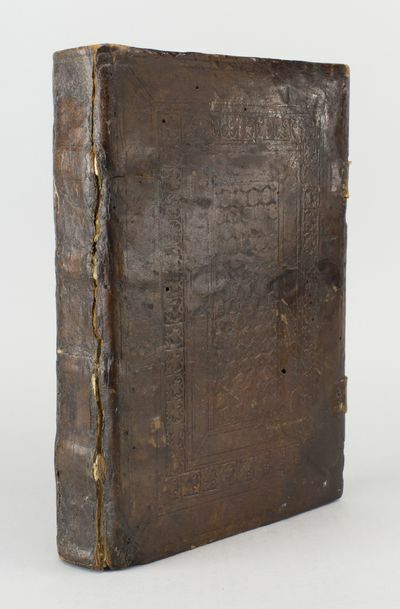 ), and the connecting fastener depicting Moses holding the tablets (possibly from an earlier Italian binding, or in an earlier style; compare the eighteenth-century Italian embossed silver binding, New York Grolier Club, MS 11, which includes a similar depiction of Moses), silk doublure and facing flyleaves, gilt edges, in excellent condition, slight wear at front hinge, in slipcase. TEXT: This is a luxurious volume, carefully written, with attractive penwork initials and five illuminated pages, including two full borders, in almost pristine condition with few signs of daily used, bound in an equally luxurious binding. Although this Breviary follows the liturgy of the Papal Curia, which was first adopted by the Franciscans in the thirteenth century, it was certainly made for a person of wealth, perhaps the patron of a Franciscan monastery. It includes an unidentified coat-of-arms, which when identified should help complete the story of its origin. ILLUMINATION: The style of illumination, distinguished by a vibrant and attractive color palette featuring deep red, vivid green, and purple, is in keeping with the style generally popular in Northeastern Italy, including Verona, Venice and Padua in the middle to the third quarter of the fifteenth century; although it has not been attributed to a particular artist manuscripts Antonio de Stefano in Verona use similar decorative motifs. PROVENANCE: Dated by the scribe, July 17, 1456. The rubrics identify it as Use of Rome and the sanctorale and calendar include numerous Franciscan saints. Unidentified coat-of-arms, presumably of the original owner or patron, f. 7, azure fleur de lis or party per pale quarterly gules a fess argent and or five torteaux and one hurt. The manuscript apparently remained in Italy until modern times when it was bound in Modena. CONDITION: In very good condition, ink on a number folios is faded and has partially powdered away (occasionally rewritten in darker ink), f. 1, darkened, text smudged and partially rewritten and repaired in the inner margin, f. 93v, slight damage to border, lower margin, f. 417v, lower half darkened, f. 413, small stain, trimmed, with slight loss of decoration in the upper margins on a few folios, although generous margins remain. Full description and photographs available at www.textmanuscripts.com reference number 517. Portrait of Sultan Umar Sheikh Mirza. Prob. North India, second half of 19th century. 1456. Gouache on paper with floral borders in gilt and red title within cartouche. C. 170 x 120 mm. Framed and glazed. Very decorative, high-quality miniature portrait of Sultan Umar (Omar) Mirza (1456-93), a Timuride prince from the Fergana valley. He is revered as father of Babur (1483-1530), founder of the Indian Moghul empire. The Arabic captions translates as: "The blessed portrait of Sultan Umar Sheikh Mirza". - Very clean. A comparable portrait is in the Brooklyn Museum (accession no. 59.205.9). Italy [Florence], colophon dated 1456-57. n. TThis beautifully crafted work contains a dated but unpublished text that was compiled for the private edification and elevation of an unknown patron obviously with considerable means, clearly with a desire to attain greater understanding, and apparently without the classical learning typically needed for ready access to it.Â The manuscript contains excerpts from five books of the Bible (Isaiah, Jeremiah, Job, Psalms, and Proverbs) as well as various texts written by four of the Latin Church Fathers. These include Jerome, "Epistles" (ff. 46r-130v) and "Homilies on Ezechiel" (ff. 130v - 153r); Augustine, "City of God" (ff. 135r - 140r) and "Confessions" (ff. 140v - 146v); Ambrose, "De Iacob et Vita Beata" (ff. 146v - 150r); and Cyprian, "Ad Donatum" (ff. 150v - 151r). Each excerpt is presented in the original Latin followed by the Italian translation in contrasting ink, making this not only an object of great interest from a scholarly standpoint, but also aesthetically very pleasing to look at. While the author/translator of the text remains anonymous, the manuscript has recently been identified as a sister copy of Rossi MS 88 at the Accademia Nazionale dei Lincei, and MS 335 of the Biblioteca Riccardiana, (both of which manuscripts are without dates). The Riccardiana MS can be placed at the Dominican convent of San Marco in Florence by the mid-16th century at the very latest. Given this early association, it seems quite possible that the author would have been connected to the convent in some significant way. The Riccardiana manuscript is notably smaller than the present one, and its more modest dimensions would have been suitable for an inmate at the convent. By contrast, the larger, more opulent version seen here (and in the Rossi MS) would have been more appropriate for the use of a wealthy patron. The convent of San Marco did not lack for illustrious connections and was itself an important center for art and culture in the Medici-ruled Florence of the 15th century. Its status was in no small way bolstered by the efforts of the great patron of the arts Cosimo il Vecchio de' Medici (also known as "the elder"), who not only kept a cell on the premises, but also took it upon himself to renovate the aging structure. Among the notable artists who contributed to its renewal were the sculptor and architect Michelozzo (d. 1472) and painter Fra Angelico (d. 1455); it was also the site of the first public library in Florence. The Medici connection is further evident in the Rossi MS, which contains an ownership inscription of a senior Medici court official. Being a match for our copy in both size and lavishness, it is entirely possible that the manuscript offered here was destined for similarly noble hands. The fact that our text appears both in Latin and the vernacular further indicates an original owner whose birth may have been high but whose education might not have included the exacting Latin study of the ecclesiastic (in any case, the diglot text is an unusual feature of the manuscript, whoever owned it). With an interior that has retained its freshness and visual appeal, including a fine hand, skillfully designed glittering initials, and wide margins, this particular manuscript provides both an excellent specimen of the Italian Humanist period and a testament to this extraordinary time with its extraordinary patrons.. 268 x 187 mm. (10 1/2 x 7 3/8"). 176 leaves (complete). Single column, 31 lines alternating red ink for Latin and dark brown ink for Italian translation, in a very fine humanist hand. Contemporary panelled calf over wooden boards, with central chain design and foliate border, original clasps replaced with modern hardware, edges gilt and gauffered with chevrons and flowers, expertly rebacked to style. Paragraph marks in red or blue, initial letters of each sentence in contrasting color to main text, running titles in red, 10 ORNATE WHITE VINE STEM INITIALS, the first two very large and extending quite far down the page, the letters burnished gold and skillfully linked with white vines against a pink and green background outlined with blue and further decorated with clusters of white dots (the drawing of a marginal female crowned head on one page). Front endleaf with 17th or 18th century signature of Eduardo Lopez, dated colophon on final page, rear pastedown with a 19th century English price code in pounds and shillings. Binding with a few small wormholes, general wear, and significant (careful) restoration, but still retaining much of its original appeal; red ink not infrequently faded to varying degrees (though never illegible), a few light scuffs or thumb smudges on the title and the occasional leaf, otherwise in thoroughly excellent condition, entirely fresh, quite clean, and with ample margins. TThis beautifully crafted work contains a dated but unpublished text that was compiled for the private edification and elevation of an unknown patron obviously with considerable means, clearly with a desire to attain greater understanding, and apparently without the classical learning typically needed for ready access to it.Â The manuscript contains excerpts from five books of the Bible (Isaiah, Jeremiah, Job, Psalms, and Proverbs) as well as various texts written by four of the Latin Church Fathers. These include Jerome, "Epistles" (ff. 46r-130v) and "Homilies on Ezechiel" (ff. 130v - 153r); Augustine, "City of God" (ff. 135r - 140r) and "Confessions" (ff. 140v - 146v); Ambrose, "De Iacob et Vita Beata" (ff. 146v - 150r); and Cyprian, "Ad Donatum" (ff. 150v - 151r). Each excerpt is presented in the original Latin followed by the Italian translation in contrasting ink, making this not only an object of great interest from a scholarly standpoint, but also aesthetically very pleasing to look at. While the author/translator of the text remains anonymous, the manuscript has recently been identified as a sister copy of Rossi MS 88 at the Accademia Nazionale dei Lincei, and MS 335 of the Biblioteca Riccardiana, (both of which manuscripts are without dates). The Riccardiana MS can be placed at the Dominican convent of San Marco in Florence by the mid-16th century at the very latest. Given this early association, it seems quite possible that the author would have been connected to the convent in some significant way. The Riccardiana manuscript is notably smaller than the present one, and its more modest dimensions would have been suitable for an inmate at the convent. By contrast, the larger, more opulent version seen here (and in the Rossi MS) would have been more appropriate for the use of a wealthy patron. The convent of San Marco did not lack for illustrious connections and was itself an important center for art and culture in the Medici-ruled Florence of the 15th century. Its status was in no small way bolstered by the efforts of the great patron of the arts Cosimo il Vecchio de' Medici (also known as "the elder"), who not only kept a cell on the premises, but also took it upon himself to renovate the aging structure. Among the notable artists who contributed to its renewal were the sculptor and architect Michelozzo (d. 1472) and painter Fra Angelico (d. 1455); it was also the site of the first public library in Florence. The Medici connection is further evident in the Rossi MS, which contains an ownership inscription of a senior Medici court official. Being a match for our copy in both size and lavishness, it is entirely possible that the manuscript offered here was destined for similarly noble hands. The fact that our text appears both in Latin and the vernacular further indicates an original owner whose birth may have been high but whose education might not have included the exacting Latin study of the ecclesiastic (in any case, the diglot text is an unusual feature of the manuscript, whoever owned it). With an interior that has retained its freshness and visual appeal, including a fine hand, skillfully designed glittering initials, and wide margins, this particular manuscript provides both an excellent specimen of the Italian Humanist period and a testament to this extraordinary time with its extraordinary patrons. Ueber die phantastischen Gesichtserscheinungen. Eine physiologische Untersuchung mit einer physiologischen Urkunde des Aristoteles über den Traum. FIRST EDITION. This book contains further studies on specific nerve energies, following on from his Zur vergleichenden Physiologie des Gesichtssinnes des Menschen und der Thiere published earlier in the same year. In it Müller showed that the sensory system of the eye not only reacts to external optical stimuli but also can be excited by interior stimuli arising from organic malfunction, lingering mental images, or the play of the imagination. When the stimulus is mistakenly assumed to have originated outside the body, the result -- depending on the situation -- is the reporting of religious or magical visions, or the seeing of ghosts. The observations on hallucinations, clairvoyance, and dreams, which form the second and third parts of this work, are of importance for the history of psychiatry.G&M 1456. Grolier, 100 Books Famous in Science, 76. See Fulton, Selected Readings in the History of Physiology, pp. 289-291 (according to Fulton, Müller?s law was first stated in the present book). Rothschuh, Geschichte der Physiologie, p. 115. Norman catalogue 1567.8vo, pp. x, 117. Some foxing and light browning. Twentieth century half calf, uncut, original green upper wrapper bearing the book label of Edgar Goldschmid (1881-1957), bibliographer of pathology, bound in. GAUSS, Carl Friedrich & WEBER, Wilhelm (eds.). Resultate aus den Beobachtungen des magnetischen Vereins im Jahre 1836 [-1841]. [With:] Atlas des Erdmagnetismus nach den Elementen der Theorie entworfen. Leipzig: Weidmann, 1840.Göttingen & Leipzig: Dieterich & Weidmann, 1837-43.. All first editions. Portrait des Sultans Umar Sheikh Mirza. Wohl Nordindien, zweite Hälfte des 19. Jhs.. Deckfarben auf Papier mit floralen Rahmenbordüren in Gold und roter Betitelung in Kartusche. Ca. 170 x 120 mm. Unter Glas gerahmt.. Sehr feine, höchst dekorative Miniatur des Sultans Umar (Omar) Mirza (1456-93), eines timuridischen Kleinfürsten aus dem Ferganatal. Er wird verehrt als Vater des Babur (1483-1530), des Gründers des indischen Mogulreiches, als dessen Stammvater Umar daher ebenso angesehen werden kann. Die Inschrift in arabischer Sprache lautet übersetzt: "Das gesegnete Portrait des Sultan Umar Sheikh Mirza". - Praktisch fleckenlos. Ein vergleichbares Portrait aus derselben Zeit befindet sich im Brooklyn Museum (Inv.-Nr. 59.205.9). Mazarine-Bibel. Biblia Sacra Mazarinea Mainz um 1456. Die 42zeilige Gutenberg-Bibel. Farbige Faksimile-Ausgabe des Exemplars der Bibliotheque Mazarine.. 300 Jahre nach der Erfindung Gutenbergs entdeckte ein Pariser Antiquar 1763 in der Sammlung des Kardinals Mazarini das erste mit beweglichen Lettern gedruckte Buch, die 42-zeilige Gutenberg-Bibel, wieder. Nur 48 Originale der Gutenberg-Bibel sind heute nachweisbar. Das Exemplar der Bibliotheque Mazarine ist vollständig erhalten und in einem hervorragendem Zustand. ILLUMINATED MANUSCRIPT ON VELLUM, Northern Italy (Verona? ), dated 1456, 137 x 101 mm. 450 folios, complete (collation, i6 ii-xl10 xli8 xlii-xliii10 xliv12 [-8, following f. 437, cancelled with no loss of text] xlv10 [-10, cancelled, with no loss of text]), horizontal catchwords, ruled in ink (justification, 86-83 x 65-64 mm. ), written in southern gothic bookhands probably by two scribes, guide letters, majuscules touched with pale yellow, red rubrics, one- to two-line alternately red and blue initials, four- to three-line alternately red and blue initials with contrasting pen decoration in purple and red, THREE ILLUMINATED initials, with decorative borders in the outer margins, and TWO HISTORIATED INITIALS WITH FULL BORDERS, depicting bearded saints. BINDING: Bound in Italy in modern polished pink leather, binder&#146;s stamp, inside front cover, &#147;R. Gozzi. Modena,&#148; front cover, coat of arms in gilt (azure, three bends or, in chief, gules three towers or, with a crown above), elaborate embossed silver clasps, with both clasps, front and back covers, depicting the sacrifice of Isaac (? ), and the connecting fastener depicting Moses holding the tablets (possibly from an earlier Italian binding, or in an earlier style; compare the eighteenth-century Italian embossed silver binding, New York Grolier Club, MS 11, which includes a similar depiction of Moses), silk doublure and facing flyleaves, gilt edges, in excellent condition, slight wear at front hinge, in slipcase. TEXT: This is a luxurious volume, carefully written, with attractive penwork initials and five illuminated pages, including two full borders, in almost pristine condition with few signs of daily used, bound in an equally luxurious binding. Although this Breviary follows the liturgy of the Papal Curia, which was first adopted by the Franciscans in the thirteenth century, it was certainly made for a person of wealth, perhaps the patron of a Franciscan monastery. It includes an unidentified coat-of-arms, which when identified should help complete the story of its origin. ILLUMINATION: The style of illumination, distinguished by a vibrant and attractive color palette featuring deep red, vivid green, and purple, is in keeping with the style generally popular in Northeastern Italy, including Verona, Venice and Padua in the middle to the third quarter of the fifteenth century; although it has not been attributed to a particular artist manuscripts Antonio de Stefano in Verona use similar decorative motifs. PROVENANCE: Dated by the scribe, July 17, 1456. The rubrics identify it as Use of Rome and the sanctorale and calendar include numerous Franciscan saints. Unidentified coat-of-arms, presumably of the original owner or patron, f. 7, azure fleur de lis or party per pale quarterly gules a fess argent and or five torteaux and one hurt. The manuscript apparently remained in Italy until modern times when it was bound in Modena. CONDITION: In very good condition, ink on a number folios is faded and has partially powdered away (occasionally rewritten in darker ink), f. 1, darkened, text smudged and partially rewritten and repaired in the inner margin, f. 93v, slight damage to border, lower margin, f. 417v, lower half darkened, f. 413, small stain, trimmed, with slight loss of decoration in the upper margins on a few folios, although generous margins remain. Full description and photographs available. 517. Small 4to. A-E4 [Lacks A1-3, t.p. & dedication] facsimile of t.p. laid-in. First Edition. Disbound, minor foxing. Donato (1456/7-1511) Italian humanist and diplomat born in Venice and died in Rome. ÒHis diplomatic posts included embassies to Innocent VIII, to the city of Luca in 1496, to Alexander VI from 1497 to 1499, to Maximilian I in 1499, to Louis XII of France from 1501 to 1502, and to Julius II in 1505 and again from 1509 to 1511.Ó He served successively as governor of Brescia, Cremona, & Candia. As a humanist, his activities were closely tied to his friend, Ermolao Barbaro. ÒHe was also interested in the schism between the Latin and Greek churches.Ó The ÒPrincipatuÕ was published after his death and was dedicated by his son to Clement VII. [See: Bietenholz, Contemporaries of Erasmus, I, pp. 396-97) Index Aurel. 154.995. EDIT cnce 17627.Sander 2479. [See: P. Rigo, Catalogo e tradizione degli scritti di Girolamo Donato, ÒAtti dellÕAccademia nazionale dei Lincei, Rend. Classe Scienze moraliÓ, XXXI, 197. ].